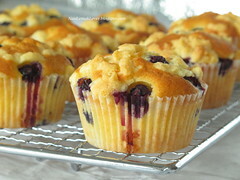 Thinking to make blueberry crumble muffins as seen in Okashi book, but i decided to change it to blueberry crumble cupcakes as I wish to submit to Aspiring bakers#13-Enjoying cupcakes! My 1st time baking cake top with crumble, love the sweetness and buttery crumble. I will include more crumble topping in my future baking..
Also my 1st time made cupcake with fresh blueberries, tasted very refreshing. Last time i made with store bought blueberries filling, this is definitely can't compete with fresh blueberry. 1. Make crumble topping. Combine ingredients in a bowl and mix with fingers until mixture resembles coarse breadcrumbs. Refrigerate until needed. 2. Preheat the oven to 180C. Put 8 paper cases in a muffin pan. 3. Put the butter and sugar in a mixing bowl, and beat together until light and fluffy. 4. Add egg one at a time, combine well. 5. Add in the flour and milk alternately, fold till well combine. 6. Add in blueberries, mix well. 7. Spoon the mixture into the paper cases. Top with few blueberries, then sprinkle crumble topping over. 8. Bake the cupcakes in the oven for 25-30mins, or until risen and firm to the touch. 9. Transfer to a wire rack and let cool. I am submitting this post to Aspiring Bakers #13: Enjoy Cupcakes! (November 2011) which hosted by Min of Min's Blog. Your cupcakes looks wonderful! The crumble with the blueberries looks so delicious! Another wonderful bake! One of your best looking cupcakes yet ;)It looks so gorgeous and mouth watering ;D Re your photo thief :P - as of now , your photo is still in her blog tsk & that blog is based also in Malaysia ? 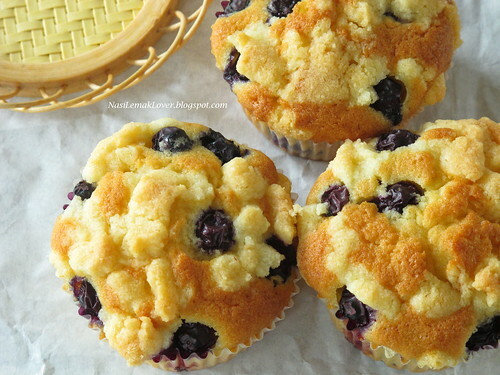 Absolutely divine, super inviting muffins. Lovely click and nice cupcakes! I've not bake anything with crumble top too :) Should try one day! Your cupcakes look very moist and fluffy! 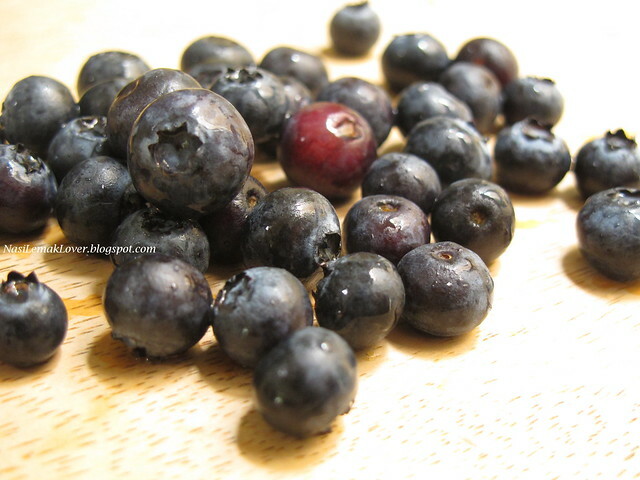 Love those juicy blueberries, and plenty of them too! What a fantastic combination! I'd never have thought of combining a crumble and a cupcake together. I'm not one for cupcakes usually but this tickled my tastebuds. :D Lovely! I love anything with berry especially saskatoon berry and blueberry. 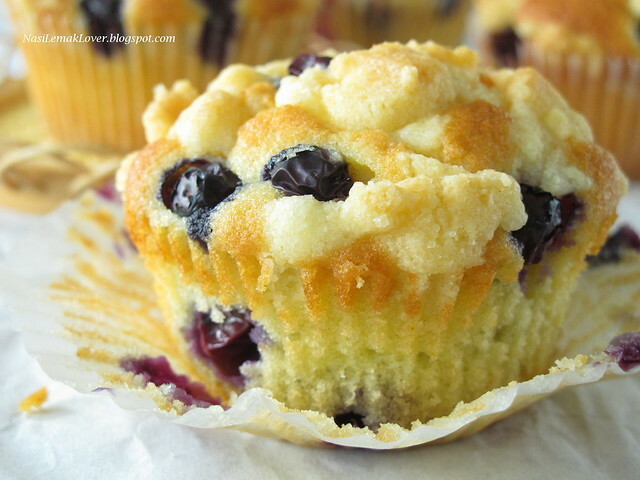 Hey Sonia, today is blueberry cupcake day..saw you and Eileen both post the similar cupcake. This cupcake looks great with the crumble top. Hi Sonia, just read about someone has stolen your recipe and photo and claimed as his/hers! I looked at his/her facebook just now, he/she got lots of complaints from others.Shame on him/her! I used to follow 厨思の天地 which I used their recipe for making my banana chips but then I realised that they also copied others recipe & photos and post on their own website, though they did mention on their profile that that they cook and also use other bloggers postings,I have stopped following their website now! 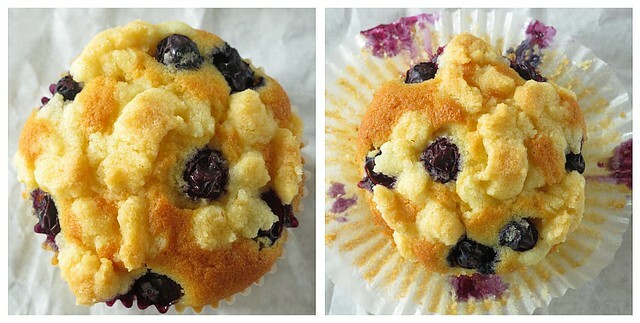 Oh, this is about your blueberry crumble cupcakes, I'm going to mark this in my cooking list. They look so delicious! And also love your cute cute little bamboo coasters! Oh dear, I'm sorry to learn that there are people stealing your photos! My my how silly can they be? But good that they have been discovered. :) shame on them! Btw, I love blueberry crumble cake....when they are just out of the oven, love the crumble top, so yummy! 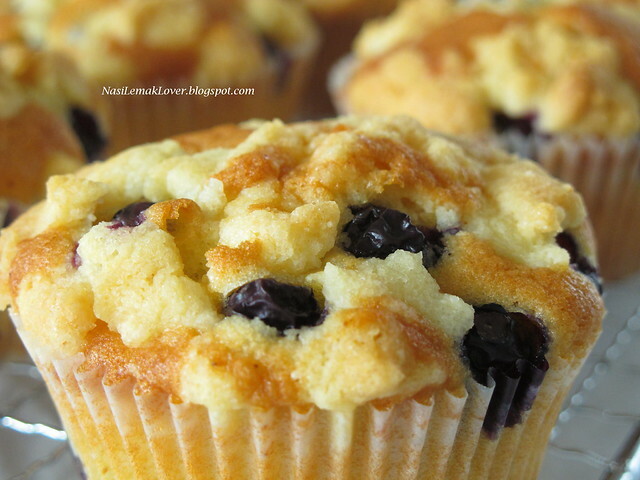 This Blueberry crumble cupcakes of yours looks real delish.... you bet, I am going to make this soon too. Wonderful cupcakes for tea. I love crumble topping on cake and pie too. Hi reader in Klang, use the milk in liquid, just normal full cream milk or low fat milk..or fresh milk also ok.
Jessie, Thanks for your feedback. Your cupcakes look very pretty and yummy. These cupcakes look so scrumptious! Would love to try but have to stop baking cakes for now, somebody complaining putting on weight lol! 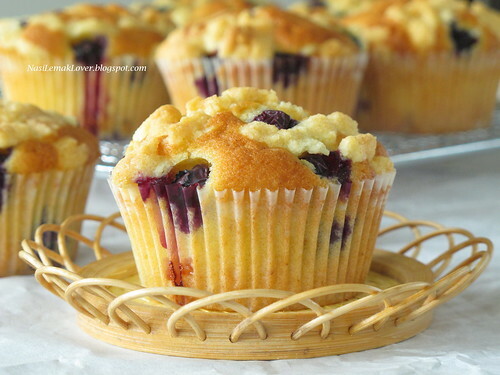 These cupcakes look very elegant with the fresh blueberries. Another great recipe to bookmark. Another keeper recipe from you after the banana muffins. Lovely bake Sonia. I'm just drooling here. Now Why can't I get invited myself over to your home? Hope you won't kick me out dear. 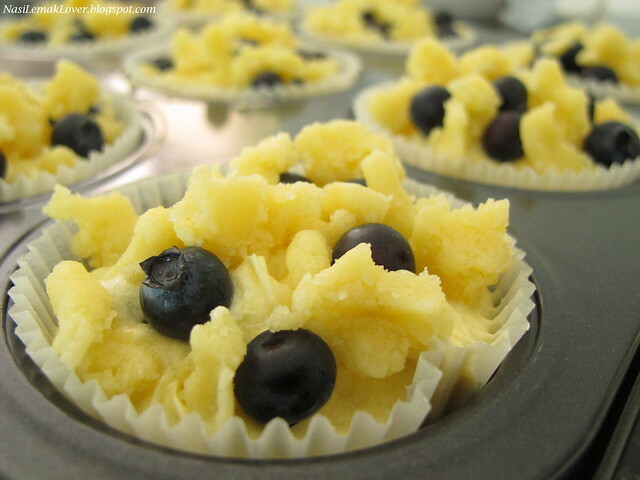 Oh I love blueberry and this crumble cupcakes look nice! Looks really fluffy and delicious! Is Okashi cookbook famous? I saw that book was referred on another blogger (well title is easy to remember for me). 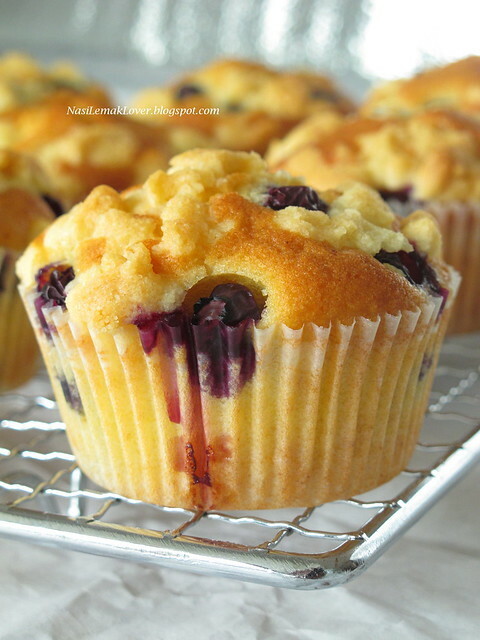 Yupe Yupe, agreed with u, the fresh blueberry makes difference, after trying the fresh one, I seldom have the one with jam in stead..
Look yummy~~~ consider to made this weekend! Definitely no manners at all. Why bother to blog at all if they're not willing to write their own content. Stealing other people's work is downright low. Blogs with no substance will not last very long. this cc looks sooo yummy...nak satu! Sonia, wonderful cupcakes! Last time I used fresh blueberries in baking too, they really fair much better than the canned one. I love the crumbles on the cake too, look so tempting! emh....which should I bake ? Both looks so tempting !! Your crumble topping turned out very good, beautiful! Amazing mouthwatering clicks and so very delectable. The cupcakes look really pretty especially with the crumbly topping and beautiful purple berries peeking out of it. yummy - i love crumble too and fresh blueberries are absolutely lovely right? After trying fresh ones I never want to use those canned ones anymore! one of the most delicious looking cupcakes i'm looking at!! I like crumbles topping. Will bookmark this recipe. Sonia, can I omit the almond powder, will it be tasted differently? wow. your first photo is gorgeous. Jes's deli corner, yes, you can, change the almond flour amount to all purpose flour. But, the taste will less aroma without almond flour. I can't help falling in love with this cupcakes ! Hi Sonia, I've tried to bake this using your recipe!Very yummy! Hi Sonia, I enjoy reading your blog, it wonderful. Wow this cupcake lokk very yummy. I must try out this recipe. Thank you. Hi, I have tried a few recipes from your site and they always turn out very good. Thanks so much for sharing. Just like to ask you, why does my cakes peels off from the paper wrappers and they dont come out nicely like yours. Has it got anything to do with the type of wrapper or the muffin pan or tart cups that you put in. I use the tart types. Hope you can kindly shed some light to my problem. Thanks so much. Anonymous (may I know your name please), for this muffin, I just use the normal white paper cases, but I use muffin pan to bake this cupcakes..
Hi Sonia, I baked these cupcakes today and wow, they were really really delicious! The only problem I had was the blueberries all sank to the bottom of the cupcakes although I had dusted some flour on them. How should I avoid this? Thanks for your help!